Learn about the six REST constraints: uniform interface, client server, stateless, cacheable, microservices, and code-on-demand. This article is featured in the new DZone Guide to Integration, Volume III. Get your free copy for more insightful articles, industry statistics, and more. Your data model has started to stabilize and you're in a position to create a public API for your web app or device. You realize it's hard to make significant changes to your API once it's released and want to get as much right as possible up front. Now, the internet has no shortage on opinions on API design. Good REST API design is extremely hard, especially when considering that an API actually represents a contract between you and those who consume your data. Breaking this contract may have a very bad impact starting with time being wasted in development and ending with many angry users with mobile apps or services that no longer work. But, since there's no one widely adopted standard that works in all cases, you're left with a bunch of choices: What formats should you accept? How should you authenticate? Should your API be versioned? Let's first start with the basic guidelines. Representational State Transfer (REST) is a technical description of how the World Wide Web works. If you imagine that the Web is a device, and it could have an operating system, its architectural style would be REST. REST defines a set of architectural principles by which one can design Web services that focus on a system's resources, including how resource states are addressed and transferred over HTTP by a wide range of clients written in different languages. If measured by the number of Web services that use it, REST has emerged in the last few years alone as a predominant Web service design model. In fact, REST has had such a large impact on the Web that it has mostly displaced SOAP- and WSDL-based interface design because it's a considerably simpler style to use. A well-designed REST API entices developers to use the web service and is today a must-have feature. But how do you clearly define that the API is actually RESTful? REST architecture describes six constraints, and we are going to describe them below in this article. By conforming web applications, web services, and web APIs with proven REST constraints, teams can create very scalable, simple, maintainable, evolvable, and reliable systems. Each constraint adds beneficial properties to the web system. By incorporating the constraints, teams can build simple, visible, usable, accessible, evolvable, flexible, maintainable, reliable, scalable, and performant systems. 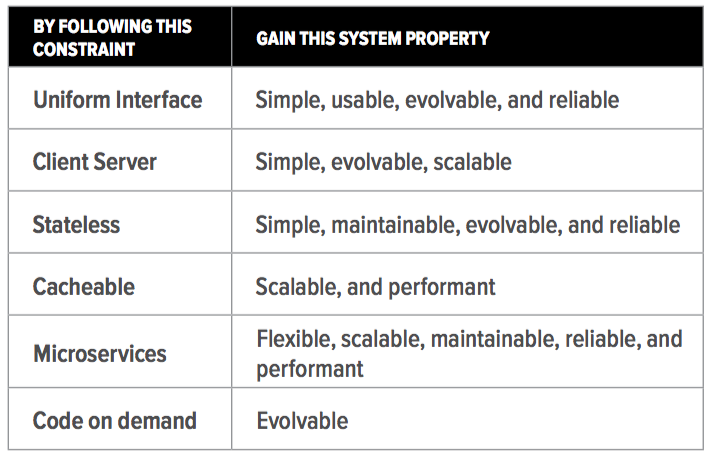 Table 1: How following specific REST constraints will result in gaining valuable system properties. Resource-Based: Individual resources are defined in requests using URIs as resource identifiers and are separate from the responses that are returned to the client. REST Web service URIs should be intuitive to the point where they are easy to guess. Think of a URI as a kind of self- documenting interface that requires little, if any, explanation or reference for a developer to understand what it points to and to derive related resources. To this end, the structure of a URI should be straightforward, predictable, and easily understood. Self-Descriptive Messages: Each client request and server response is a message, and RESTful applications expect each message to be self-descriptive. That means each message contains all the information necessary to complete the task. Other ways to describe this type of message are "state-less" or "context-free." Each message passed between client and server can have a body (or "entity body") and metadata. RESTful applications also operate on the notion of a constrained set of message types that are fully understood by both client and server. There are well-defined rules for how clients and servers are expected to behave when using these messages. The names and meanings of the messages' metadata elements (HTTP Headers) are also well-defined. Hypermedia as the Engine of Application State (HATEOAS): Clients deliver the state via body contents, query-string parameters, request headers, and the requested URI. Services deliver state to clients via body content, response codes, and response headers. A hypermedia-driven site provides information to navigate the site's REST interfaces dynamically by including hypermedia links with the responses. The uniform interface divides clients from servers. This means that, for instance, clients are not concerned with data storage, which remains internal to each server, so that the portability of client code is improved. Servers are not engaged with the user interface or user state so they can be simpler and more scalable. Servers and clients may also be replaced and developed independently, as long as the interface is not modified. There is no connection state. Interaction is stateless. Each new request should carry all the information required to complete it, and must not rely on previous interactions with the same client. The necessary state to operate the request is contained within it as a part of the URI, query-string parameters, body, or headers. The URI identifies the resource, and the body contains the state of it. Well-managed caching partially or completely eliminates some client-server interactions and improves the performance. Encapsulates a customer or business scenario. What is the problem you are solving? Written in any programming language and uses any framework. Consists of code and (optionally) state, both of which are independently versioned, deployed, and scaled. Interacts with other microservices over well-de ned interfaces and protocols. Has unique names (URLs) used to resolve their location. Remains consistent and available in the presence of failures. Microservices are applications composed of small, independently versioned, and scalable customer-focused services that communicate with each other over standard protocols with well-defined interfaces. Getting RESTful API versioning right can have a major impact on the how your API is perceived by your API consumers internally or externally, and can also make the management of your API estate more dif cult if it’s ill conceived. When starting to design and develop a RESTful API, you first must learn the constraints REST is enforcing to the system you are building. Violating any constraint other than Code on Demand means that service is not strictly RESTful. Complying with all constraints, and thus conforming to the REST architectural style, will enable any kind of distributed hypermedia system to have desirable emergent properties, such as performance, scalability, simplicity, modifiability, visibility, portability, and reliability. Getting RESTful API versioning right can have a major impact on how your API is perceived by your API consumers internally or externally. Being aligned with the REST constraints will also help you with your API versioning both in your development when using the microservices constraint and in your design when creating the uniform interface constraint. For more insight on application integration architectures, REST APIs, microservices, and more, get your free copy of the new DZone Guide to Integration, Volume III!